The shofar made me cry this year. I was sitting between Ellie and Steve like any good daughter, and the hush of readiness came over the sanctuary. The Rabbi chanted the first “Tekiah” and the shofar’s clarion call rose through the hall and touched the souls of those assembled. Without warning the tears jerked forth from my eyes like a faucet turned up too high, too fast. For centuries Jews have gathered together at this time of year to thank God for the gift of last year, pray for another year of life, confess sins and beg pardon. It’s a part of my life as much as putting on shoes to go out – whether I’m thinking about it or not, being Jewish is part of my identity and heritage. One of the things I love about being Jewish is the idea of continuity – of belonging. I was hearing that shofar at 11am in Washington DC. At 11am Tokyo time, thirteen hours prior, my husband and children had heard the same call, said the same prayers, heard the same call. My tears, naturally, were for them, mourning that I was not with them to hear it, nor they with me. I have such vivid memories of both of my children’s very first Rosh Hashanahs. I held each of them as babies as the sudden blast of the shofar startled them and I comforted them, whispering the promise of connection they would feel whenever they hear that sound. It connects them to generations past; it connects them to generations in the future. This year we are not connected physically, but with that shofar blast, I could feel them there with me, reminding me that with God’s good help, we will be together next year at this time. And so, the tears. 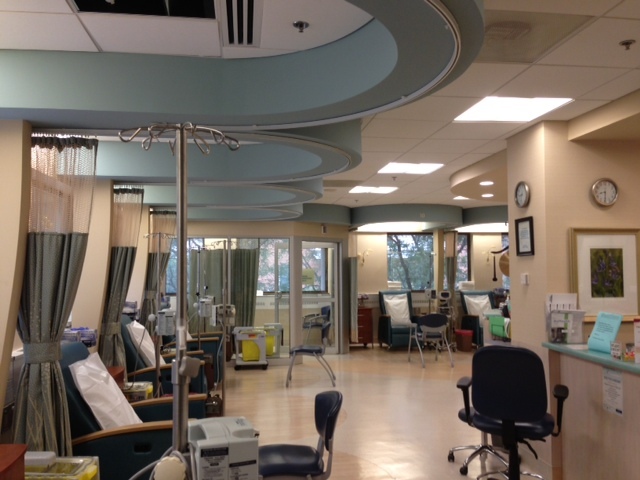 Ellie and Steve’s synagogue, B’nai Israel in Rockville, is a big place – 1500 member families. I had been there before for various events, so it was mildly familiar with its beautiful wood and stone sanctuary and center area from which the Torah is read. Having grown up in a large, Conservative synagogue, the atmosphere, as well as the liturgy, was familiar. In fact, I’d venture to say that despite its large size, the synagogue was welcoming to me. The two rabbis of the synagogue welcomed everyone to services, and on erev Rosh Hashanah, (the night before – all Jewish holidays begin at sundown the night before) as well as on both days of Rosh Hashanah, spoke of welcoming – of belonging. Their sermons sounded like they were written for me, aimed at me, spoken in light of my situation. They spoke of gratitude, of making every second count. Rabbi Schnitzer referenced a book by Joan Lunden, saying that people might not remember who won the Pulitzer Prize or the Heisman Trophy, but they do remember the kindness of a friend, the encouragement of a teacher or the touch of a loved one. He gave us the number of seconds in every day and urged us to make every one of those seconds count – every single day. He spoke of a righteous man on his deathbed not saying that life had been good to him, but rather, saying that he was good to the world. Rabbi Safra continued the theme, discussing how God had made the world, but made it to be imperfect, and thus God shows faith in man in his ability to repair the world, and so we are in partnership with God. As we are faithful to God, so is God faithful to us. Perhaps these sermons seem predictable to you, even proscribed. To me, fighting cancer every day, this entire holiday – indeed this SEASON of holidays – reminds me to be grateful for the people around me, the life that I have, and the self-awareness to be so thankful. Jews around the world are listening to similar sermons, repeating the same exact prayers, and to me it’s a comfort. These ideas and practices were around long before my birth, and will be around long after I’m gone. Continuity. My Grammy used to say that a human being’s greatest need is to belong. I believe her. At that moment, hearing the shofar in Maryland while sitting between two extra parents, even though I was sad because I wasn’t with my husband and my children, I still belonged. Indeed, it was the community that sustained me and nurtured me to reach this point. 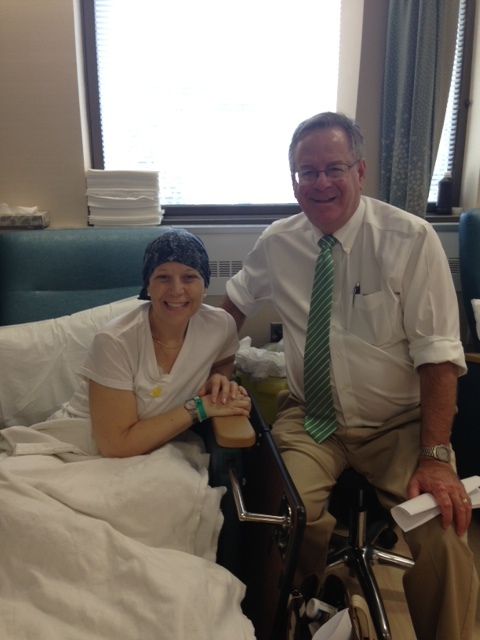 Ellie and Steve, my mom and dad, my friends, my family, my doctors – all of them are the community on which I rely for my very existence right now. 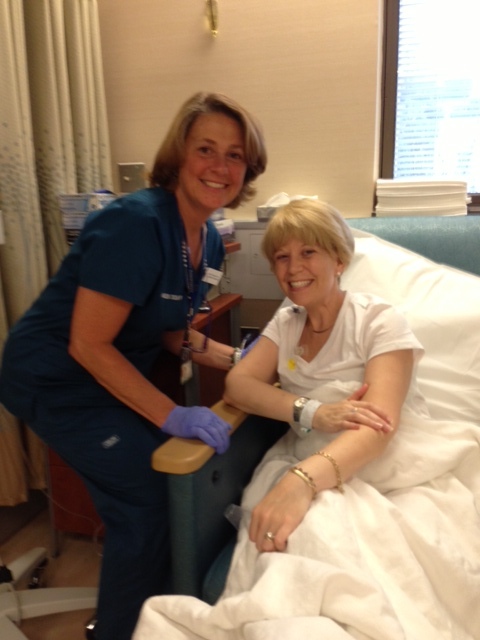 I am grateful to each person who comprises that community for helping me along this journey. 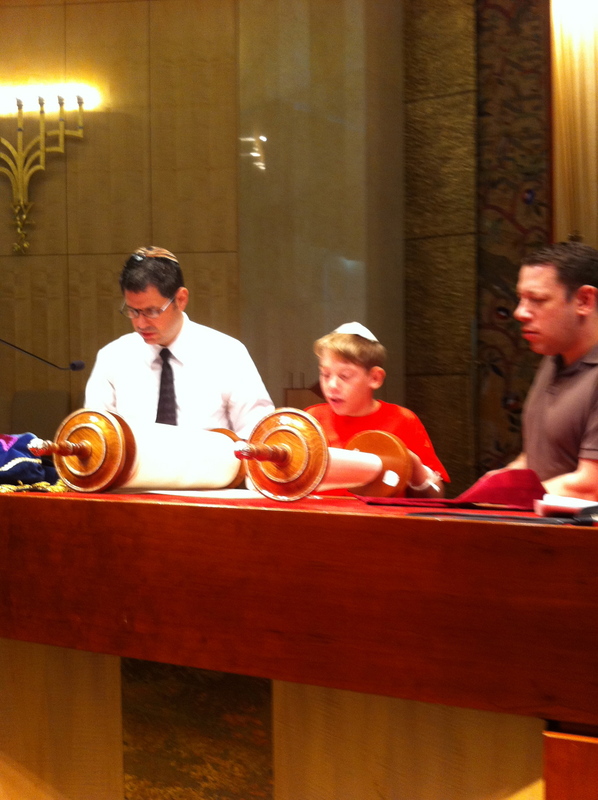 I welcome the year 5774 with a grateful heart – grateful to hear the shofar, and grateful to belong. G’mar Chatimah Tovah – may you be inscribed for a year of health, love prosperity and peace. 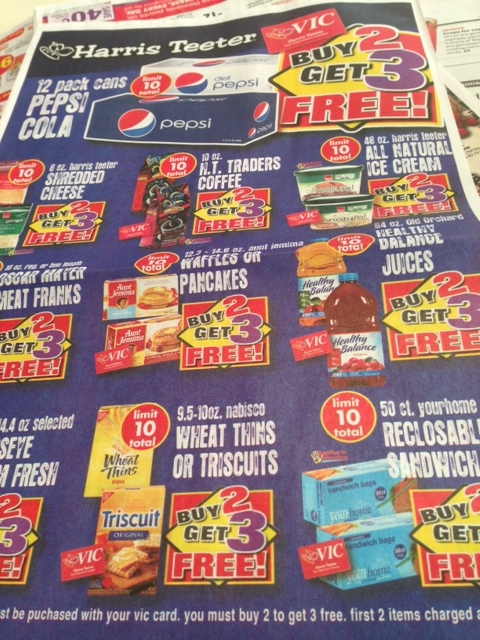 This is the advertisement in the Wednesday “Food” section of The Washington Post from Harris Teeter, a local grocery store. The point of it is that the store is looking out for the economic health of its customers and giving away items for free – albeit with a purchase. If a customer was going to buy one box of triscuit crackers, why not buy two – and then the store will GIVE him three more boxes for free. As Americans we are all accustomed to this type of pitch. There’s even an acronym for it in its purest form: BOGO – buy one; get one. This however, goes over the top – B2G3? As someone who has been living in Japan for quite a long time, it’s not just the health concern that gets me – as in, beyond having a party, who the heck is going to eat all of those hotdogs before their shelf (or freezer) life expires?? But it’s also the space. Buy two CASES of Pepsi, each of which contains 12 cans of cola, and then get another three cases, 36 more cans, for free. I can’t think of anyone I know in Japan who has storage for 60 cans of soda. I guess many Americans do have that type of storage in closet or basement, but people in Japan, especially Tokyo, do not. Japanese kitchens are smaller in general, have smaller cabinets and significantly smaller refrigerators than American kitchens. It has become fascinating to me what people in the U.S. actually keep in their cupboards. There’s a lot of “stuff” in there that people don’t even remember they have. I do not mean to criticize – just remark. I can hardly criticize – I used to do it myself! I’ve just gotten way away from it in the past 6+ years of living outside of the U.S. If you can store all of that stuff, then you are lucky to have the space. It’s just really interesting to this American girl who has moved away from it all. Well, just when you think things are going along all right, life throws a curve ball. More in tune to a writer however, as a friend of mine likes to say when things go wrong: PLOT TWIST! I wasn’t feeling so well when I left Tokyo in June for a long visit to the U.S. and there was good reason why. I have lymphoma, cancer of the lymph nodes. 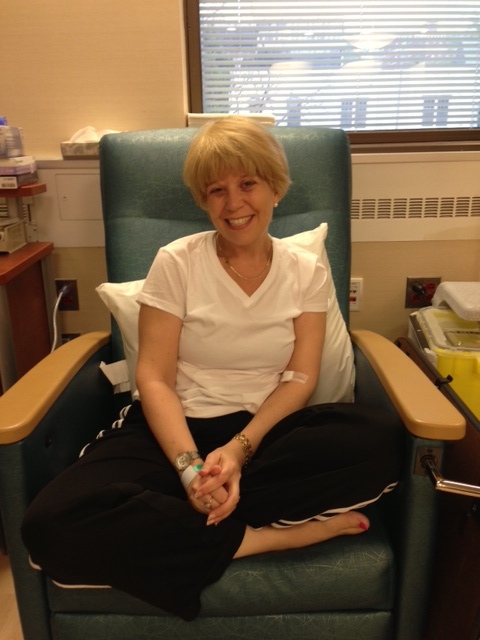 No panic necessary – it’s a curable form of cancer and I am tolerating the treatment – chemotherapy – quite well. Oh, I don’t mean to imply that it’s all fun and games, but the good news is that treatment appears to be working already and I will be my regular reading, writing and raring-to-go self in a matter of months. 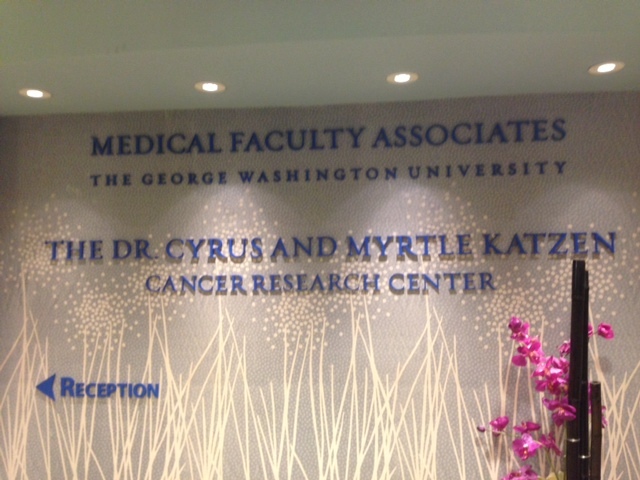 I have an excellent team of doctors at the George Washington University Hospital and my friends and family in the U.S. have been wonderful. I have treatment every three weeks through October, and then post-treatment testing, so it is likely that I will not be back in Tokyo until after the December holidays, in January. In the meantime, as I undertake this treatment, I am going to try to do some writing about not the ins and outs of cancer treatment, but more like what’s happening in my brain as I go through it. What happens in my brain is much more interesting (and less..um…gross!) than what’s up with my body. So, dear reader, I hope you will forgive my many-month digression away from solely Japan-based writing and continue to read my blog for other reasons as well. Don’t worry – I’ll be back in Tokyo and writing about it with fresh eyes in no time. Happy summer, wherever you are. Oh What a Summer it Was! I took a break from blogging for the summer, as you may have noticed, but here I am renewed and refreshed from some time away from Tokyo. I spent about ten weeks in various parts of the East Coast of the United States with friends and family. Here are a few photos that tell of our adventures. Back to my Tokyo Tuesdays next week! Meanwhile, look for my regular postings on writing and parenting on Thursday. See you soon! 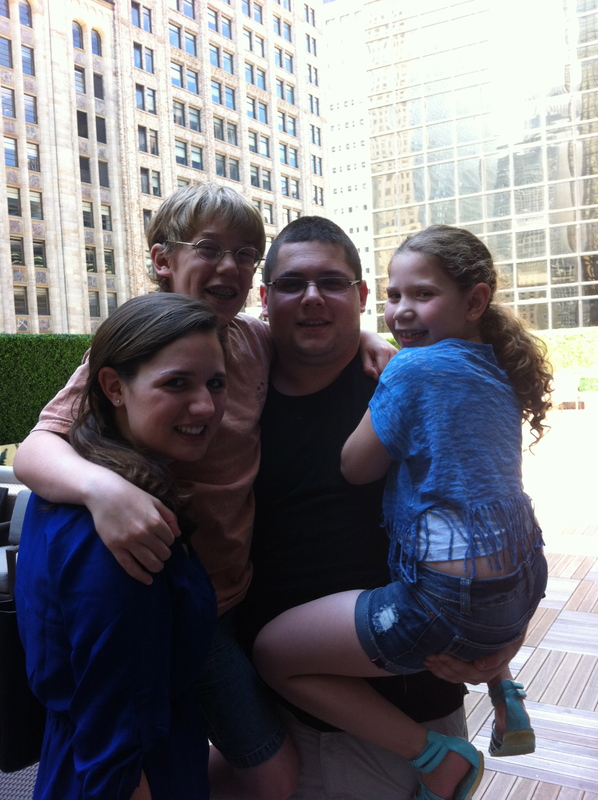 Hanging in New York City with my niece and nephew, Jake and Alyssa and my kids. 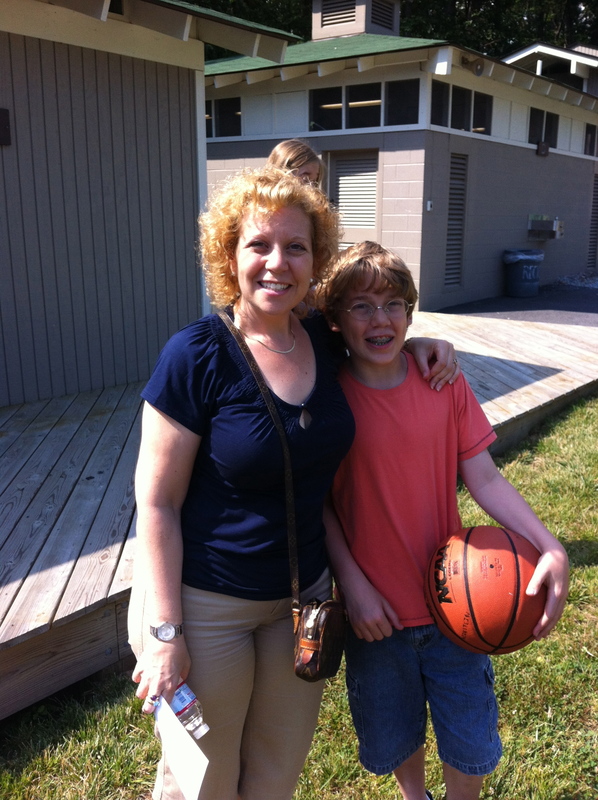 My son went to sleep away camp for a month – the city boy in the country! 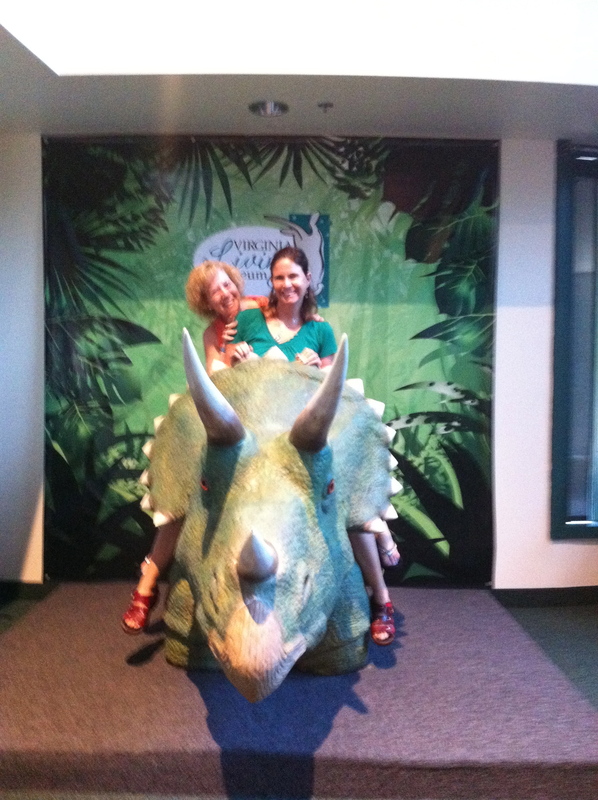 My cousin Jenn and I sat on a dinosaur at the Living Museum in Newport News, VA.
My daughter went to sleep away camp for two weeks! It was her first time and she loved it! 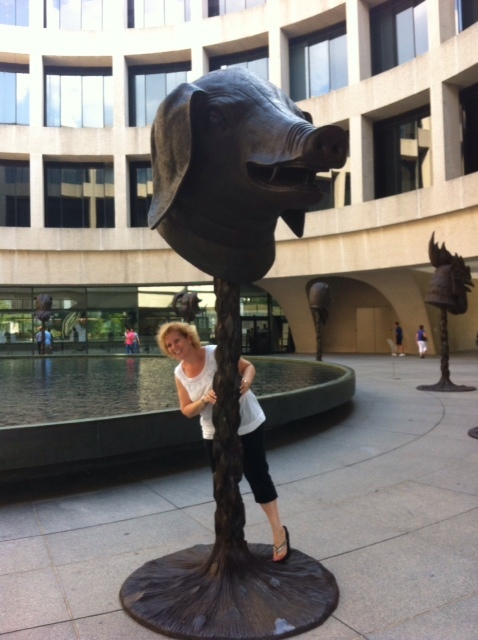 While the kids were at camp, I did a lot of exploring in Washington DC. 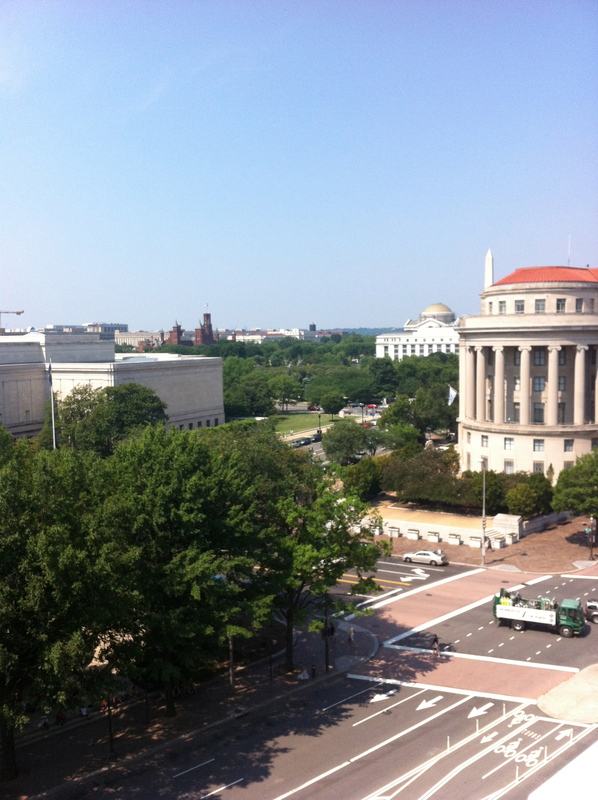 This is the International Trade Commission building, taken from the balcony of the Newseum, the museum of news. My son prepared for his bar mitzvah. More on THAT later! 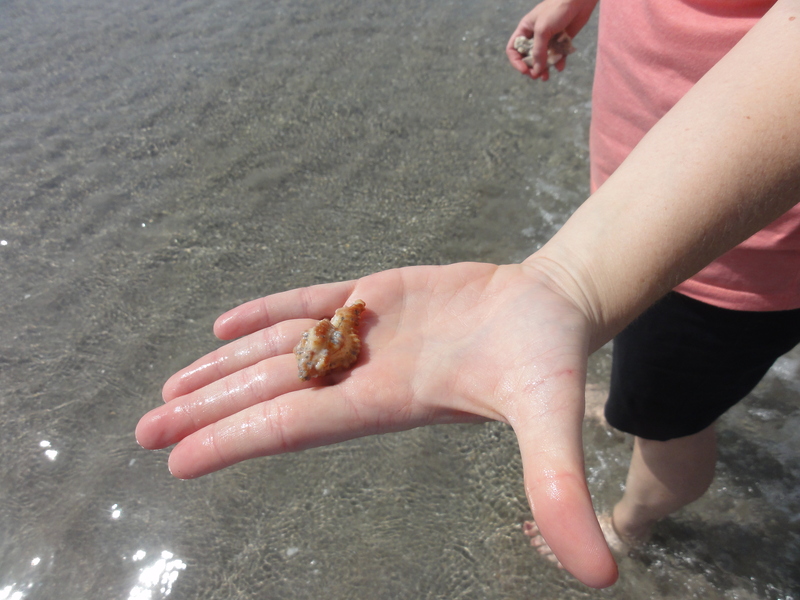 Beaches, seashells, and surfing, oh my! 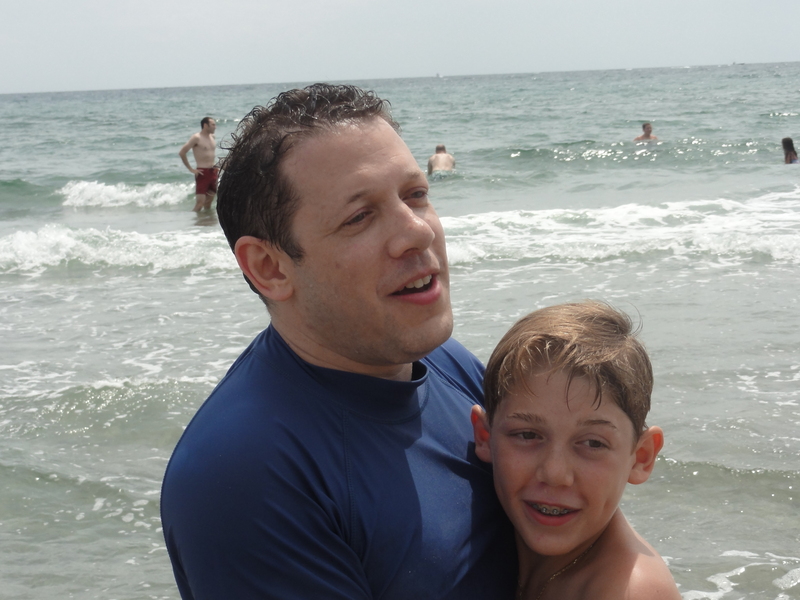 My husband and my son did not injure each other as their surfboards nearly collided! 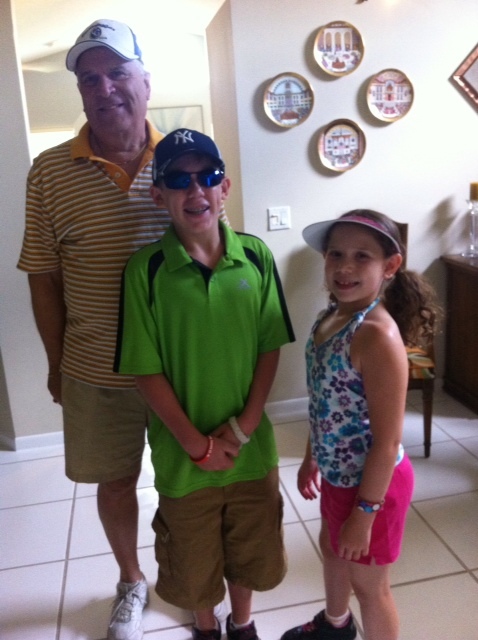 Last stop, Florida, for the bar mitzvah, my parents and my in-laws. 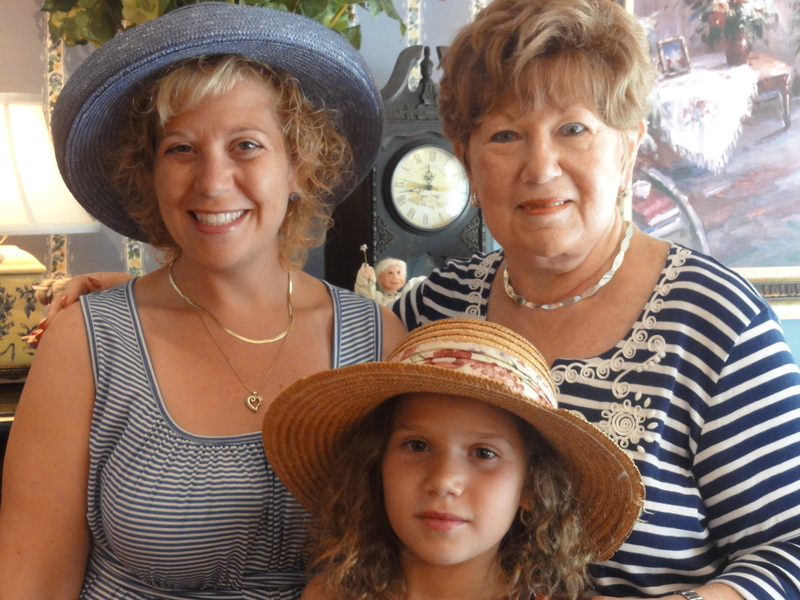 Here we are with my mother-in-law at Lady Ann’s Tea Room in Jupiter, Florida. Hats are part of the meal! It’s tourist season in Washington DC, and none of the sights are particularly new, but some are new to me. 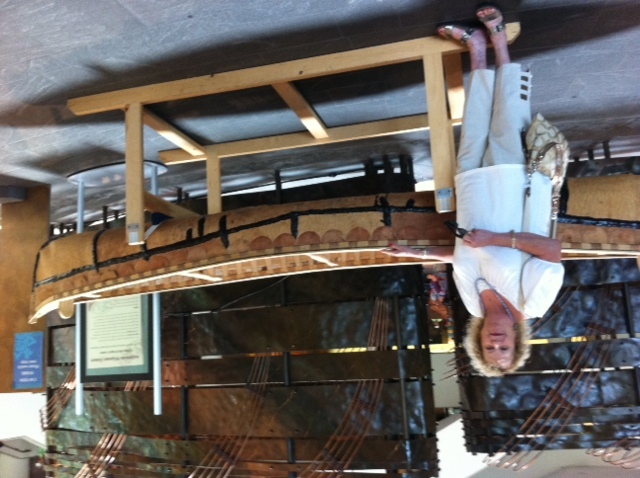 Last week I had the opportunity to go to the Native American Indian Museum with my mom, who was visiting from Florida, and it was quite an experience. The museum is designed in a circle, so one should go to the top floor, watch the introductory movie and then proceed downstairs through the exhibits, finishing on the first floor to exit. 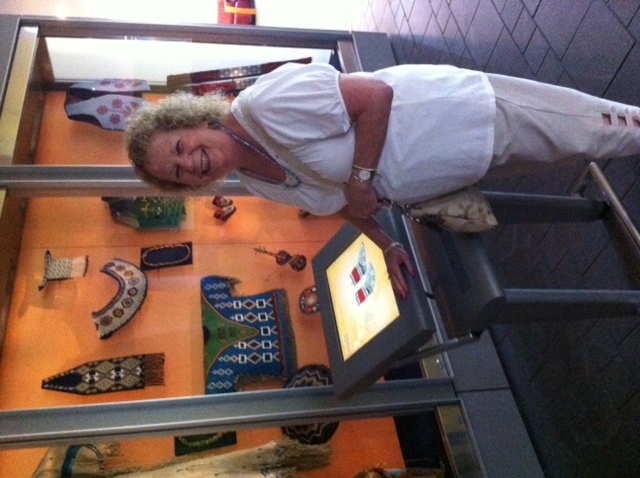 Each exhibit throughout the building is meant to touch, learn and explore. It’s perfect for kids of all ages. My favorite part was the modern art done by native Americans. What I loved, in addition to the art itself, was that if you had a smart phone, you could download an app and then if you swiped the phone by the painting or sculpture, it would give you all of the info on that particular piece. You could also call a phone number on a non-smart version to find the info. Very tech-friendly. There were huge display cases of small artistic pieces, and in front of the cases were computers on which visitors could interactively examine each one. 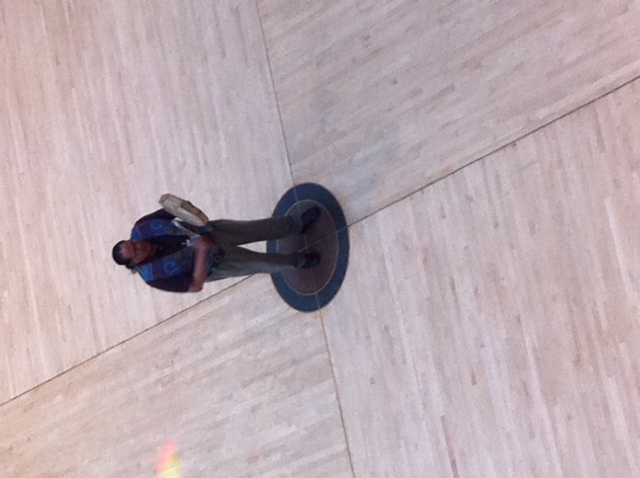 We happened to catch a performance by a Native American who works at the museum and he was doing a traditional dance with a drum. Just wonderful – mesmerizing. But by far, the best part was the cafe. Good food in a museum, you might wonder? Well yes!! It was cafeteria style, so you could choose food from about six stations and each one sported a different part of the Indian culture. 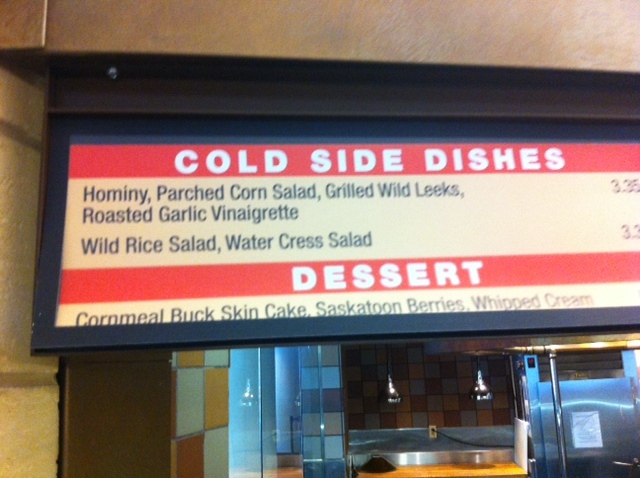 There was buffalo, corn, fruit, salads, and a million other different things that I had never heard of. My mom and I shared a funky southwestern-style taco that was basically chili over a flat bread. We also had cantaloupe soup and a tomato and watermelon salad. We shared a pumpkin cookie for dessert. It was delicious! The museum is a must-see when planning a visit to Washington DC. Go for the exhibits and stay for the food. 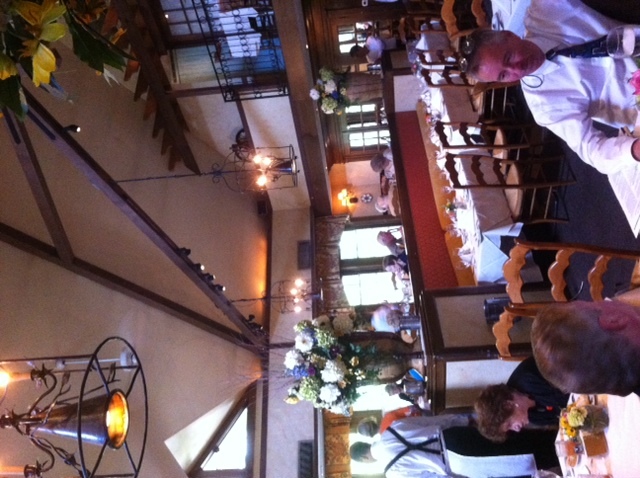 Today, Marc took me out to a great French restaurant called La Ferme. (Here’s the review from Washingtonian) Located in the gorgeous village of Chevy Chase, it is set in a copse of trees and resembles what I think of as a French farmhouse. There’s even a romantic, outdoor verandah which looks quite romantic for a cooler, non-heat-wave day. We sat at a lovely table for two which sported high-backed wooden chairs with arms, making us feel settled and comfortable. For the set menus, we could choose two courses, either appetizer and main course or main course and dessert. We both chose the former. 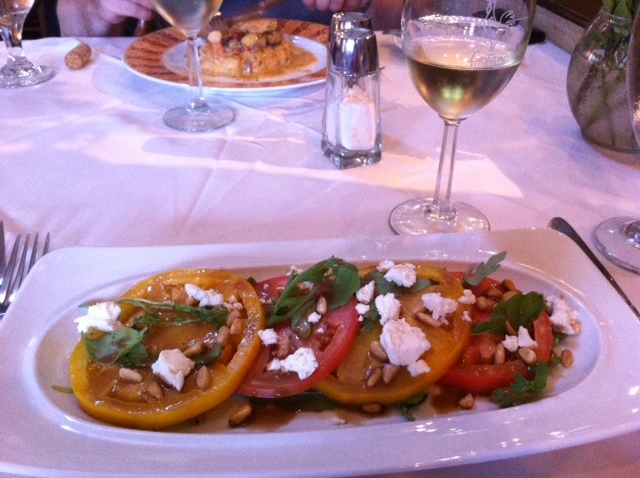 Marc had scallops in a puff pastry to start, and I had beefsteak tomatoes with arugula, pine nuts, and goat cheese. The tomatoes were crisp, yet ripe and sweet and only lightly drizzled with a balsamic reduction. The varying flavors of the cheese, nuts and tangy leaves made for a delightful layering of tastes. 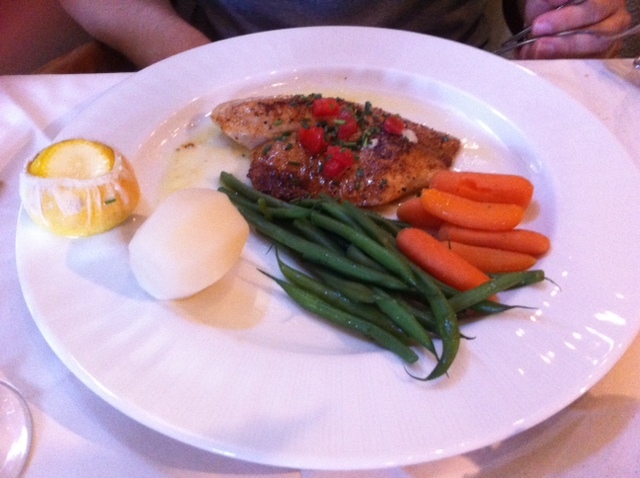 For our main courses, Marc chose a cajun-spiced tilapia that was light and flavorful without being overly spicy. 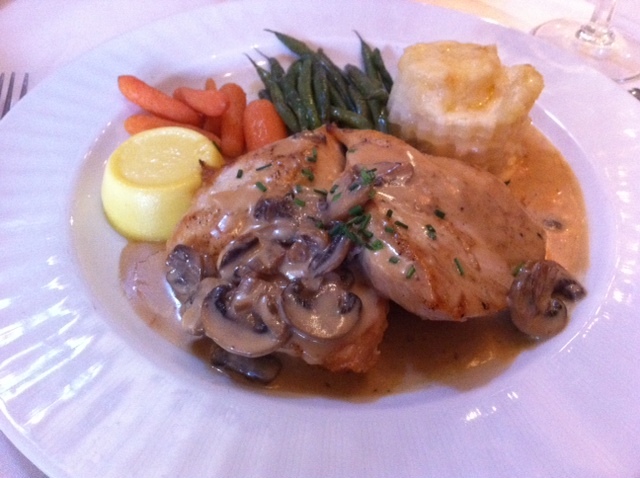 I had chicken breast in a apple brandy and mushrooms, which was juicy, cooked to perfection. In case you don’t know, in Maryland, if you don’t finish your bottle of wine, the restaurant has to cork it for you and let you take it out. We ordered a delightful bottle of white wine from a vineyard called Sancerre, which has never disappointed us. It was slightly nutty, and a perfect pairing for our meals. I only had a little bit, and Marc had one glass, so we took the remainder home so we can have more of it later. The atmosphere of the restaurant is simply charming. They have two tiny balconies above the main floor that each host a table for two and the waiter told us that many a marriage proposal has happened up there. There are huge urns of fresh flowers strategically placed around the huge room, and every inch of it is beautifully green or white. Restaurant week is a brilliant idea because now, when I am asked where I’d like to go to eat in the DC metro area, I will respond with this restaurant, and I will pay full price after this low-price introduction. The atmosphere, service, and of course, the food, are all tremendous and worth much more than the small amount we paid.